Web of Science: Is there a plant in the Icelandic flora that does not grow wild elsewhere in the world? Is there a plant in the Icelandic flora that does not grow wild elsewhere in the world? If we assume that the word plant refers in this instance to species of plant in the normal meaning of the word, where the concept species is used in rather a broad sense. Then the answer to the question is no. All plants in the Icelandic flora can be found somewhere abroad, particularly in the neighbouring northern regions, such as Scandinavia, Faroes, Greenland and Canada. There are several instances where new species have been discovered in Iceland and the initial specification made using an Icelandic specimen. 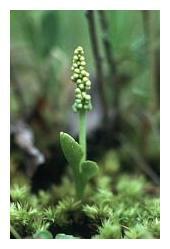 The most recent example is of the moonwort species Botrychium islandicum which was discovered recently in Iceland. Initially there were no known instances in other countries, but detailed research showed that it seems to be the same as an American moonwort species called 'little grape fern' or Botrychium simplex var. tenebrosum ("var." is for the Latin "varietas" which means variety), pictured right. If on the other hand we interpret "species" in a narrow manner, or look at varieties of species, then there are varieties that can only be found in Iceland. The explanation is probably that the icelandic flora is not old enough for it to have developed its own distinct species. But unique varieties have developed here that cannot be found elsewhere, e.g. among the hawkweeds. Hawkweeds reproduce asexuallay, and have lost the ability to mix DNA with sexual reproduction. The change relatively quickly compared to other species, and the changes are localised as there is no sexual reproduction. In this way a variety develops that is inherited by its next generation but does not mix with other varieties because reproduction is asexual, yet behaves essentially like a distinct species. Another example is a variety of the deer fern, Blechnum spicant var. fallax (pictured left), that grows here only in a geothermal environment. There are no records of this variety being found anywhere else than in Iceland. If we take such varieties into the equation then we can answer the question in the affirmative, and say that there are varieties in Iceland that cannot be found elsewhere. Some have gone so far as to consider these varieties as independent species. Those who do this are interpreting the "species" concept more narrowly than is normally done and using this interpretation we can answer the question with a yes. In order to know whether we answer the question with a categorical yes or no we must know what exactly what we mean by the word plant, whether we mean a species or a variety of a species. Robert W. Freckmann Herbarium. University of Wisconsin - Stevens Point. Photographer: Arthur Meeks. Hörður Kristinsson. „Is there a plant in the Icelandic flora that does not grow wild elsewhere in the world?“. The Icelandic Web of Science 30.12.2005. http://why.is/svar.php?id=5528. (Skoðað 21.4.2019).